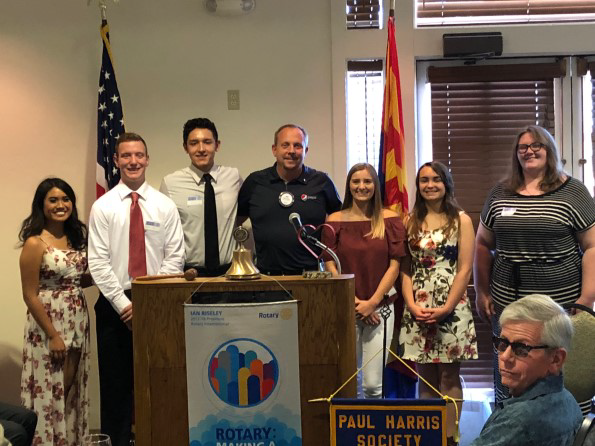 On Monday, June 18 the Rotary Club of Sierra Vista recognized the 2018 scholarship and non-profit grant recipients along with announcing the employee of the quarter and presenting a Paul Harris plus eight achievement pin. Rotary Foundation Director Les Orchekowsky recognized Bob Fusco with Paul Harris plus eight pin and thanked him for his continuous support and making a difference. Lou Kuttner stood in for President Elect Jerry Regan as director of Vocational Service to award Chris Betancourt, an estimator for Lawley Automotive, as employee of the quarter. Betancourt was nominated for his excellence in customer service and leadership. Youth Services Director Dan Crews recognized eight scholarship recipients for a total of $8,000 going towards furthering their educations. High School Senior Scholarship recipients of $1,000 each were Maryanna Barnes attending Cochise Community College, Sarah Martens attending Auburn University, Gracie Kelliher attending Baylor University, Jesus De la Rosa attending Arizona State University and Daniel Vance attending University of Arizona. The Joe Britton Vocational scholarship of $2,000 went to Stephanie Deleon who plans to attend Arizona State University and the Cochise College scholarship of $1,000 went to Gabrielle Hodgin. In the continuance of making a difference in our community President Nancy Fusco announced $4,700 in non-profit grants to the following recipients: Angel Heart Pajama Project $500, Cochise County Council for CASA $600, Boys & Girls Club of Sierra Vista $500, Cowboy Poets $500, Peaches Pantry $500, Friends of the Sierra Vista Library $500, The Salvation Army $750 and Chiricahua Community Health Centers $850. Representatives from each of the above organizations attended the meeting. Perfect attendance is still as important as it was in grade school. 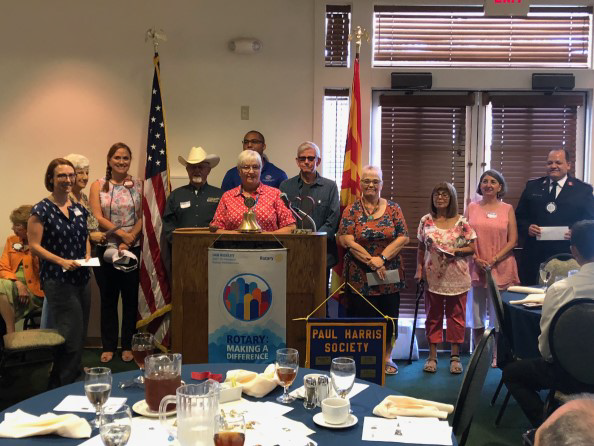 In Rotary, if you are unable to attend the weekly meeting you can make it up by volunteering for one of the community service projects, attending a committee meeting or attending another Rotary Club meeting within the area or by attending meeting of another Rotary International Club while traveling around the world or country. President Fusco presented perfect attendance pins to the following Rotary members. One year of perfect attendance Steve Johns, Randy Sueskind and Barbara Culton. Two years of perfect attendance was achieved by Poppy Harber and Angie Laskarides. Joe Puett was recognized for three years of perfect attendance, Frank Gonzales for six years, Elsie MacMillan and Nancy Fusco for nine years, John Spengler and Jerry Regan for 11 years, Bob White and Mike Strange for 15 years, K.J. Wigton for 16 years, Les Orchekowsky for 17 years, Bob Fusco for 25 years and Tony Waalkens for 36 years.